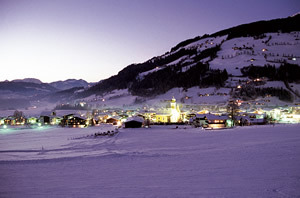 Located approx 15km from Kitzbuhel, and in the heart of the region known as the Kitzbuheler Alps, Westendorf is a typical Tyrolean village, with access to some great skiing of the SkiWelt Kaiser-Brixental. The SkiWelt Wilder Kaiser-Brixental offers supreme comfort on the piste with more than 250 km of runs for all levels of difficulty. Modern lift facilities ensure a quick and safe ascent. The sunny ski resort is equally popular with sporty skiers as well as families. More than 70 cosy ski huts and mountain restaurants spoil you with traditional and/or international specialities. The ski resort has been given the TOP Ski Resort award several times already. Families and those seeking recreation will find an ideal winter or summer holiday base. ce skating, tobogganing, curling, indoor swimming pool, cross country skiing, wellness and beauty centre. typically Tirolean atmosphere, with many of the hotel bars being top favourites for apres ski. indoor swimming pools in the area, skating rink, walking, not far from Kitzbuhel and other places to visit.